Recently, on a 93 degree day, I found myself with four pounds of beautiful, fresh stewing meat and no idea whatsoever of what to do with it. 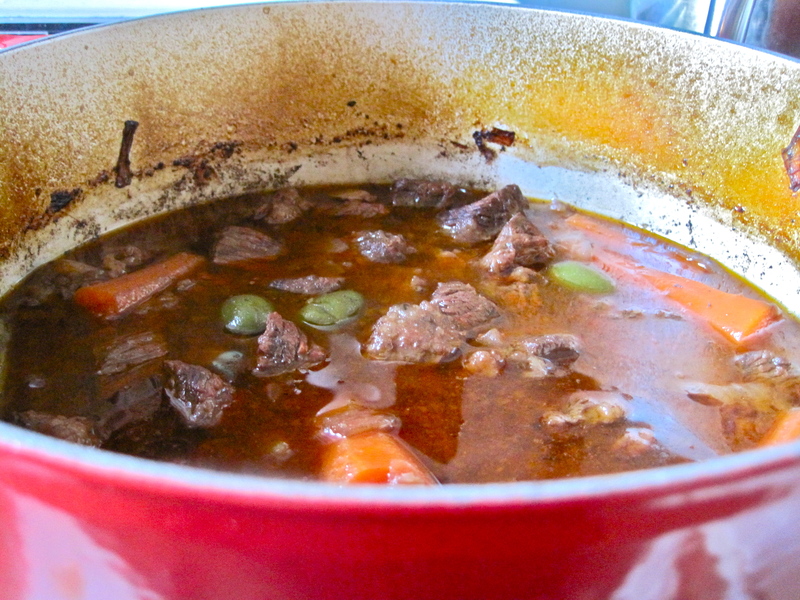 The fact is, I have been wanting to recreate the Boeuf en Daube from To The Lighthouse since even before the advent of Yummybooks, but had always felt too intimidated by its fancy French name and three day marinating time—not to mention the terrifying prospect of having to re-read To the Lighthouse. I have a complicated relationship with Virginia Woolf dating back to one excruciatingly boring course I took on modernist writers while in college. Perhaps it was the oppressive fluorescent lighting and corrugated office ceilings in the lecture hall, or the professor’s monotone and uninspired rants, or the sea of NYU students raising their hands to “ask questions,” which really meant telling some pointless anecdote about their own lives—I digress. Whatever it was, Virginia and I just could not get along. The professor loved to use the words “otherworldly” and “ethereal” when describing Woolf, and when one day a student finally asked for an example of this ethereal otherworldliness the professor mentioned as proof that there is “hardly any food at all in any of her novels.” It was at this point that I started to doubt that the professor had ever even read any of the books he was teaching us—he was so terribly, terribly wrong! For all of my irritation and frustration with dear Virginia her food scenes were actually one of the main reasons I persevered through her novels. In A Room of One’s Own there are “soles, sunk deep in a dish, over which the college cook had spread a counterpane of the whitest cream,” and “partridges, many and various [which] came with all their retinue of sauces and salads, the sharp and the sweet, each in its order;” and “potatoes, thin as coins but not so hard, their sprouts foliated as rosebuds but more succulent” and “a confection which rose all sugar from the waves. To call it pudding and so relate it to rice and tapioca would be an insult.” In The Waves there are Neville’s “delicious mouthfuls of roast duck, fitley piled with vegetables,” butter seeping through Bernard’s crumpet and “the delicious hotness & scent of pheasant & the grey dry bread crumbs; & the heaping up of soft bread sauce, and the [half] pungent, curious taste of brussel sprouts.” In Mrs. Dalloway there are the chocolate éclairs that Miss Killman, in her white gloves, so greedily eats. And in To the Lighthouse there is the boeuf en daube—the holy grail (or one of about seven) of all literary meals. 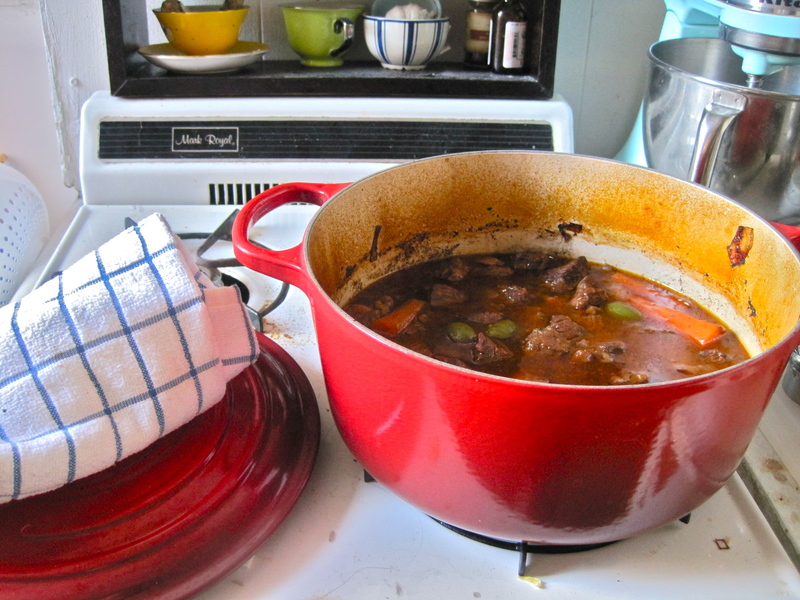 …they were having Mildred’s masterpiece—boeuf en daube. Everything depended upon things being served up the precise moment they were ready. 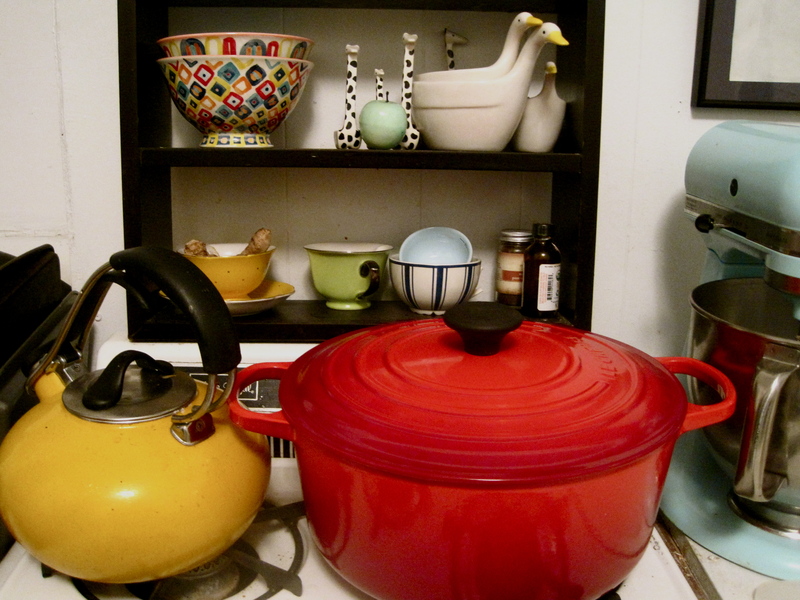 The beef, bay-leaf, and the wine—all must be done to a turn. To keep it waiting was out of the question. “It is a triumph,” said Mr. Bankes, laying his knife down for a moment. He had eaten attentively. It was rich; it was tender. It was perfectly cooked” (94, 117, 123). One can’t mention Virginia Woolf and food without mentioning that Woolf herself battled anorexia nearly her entire life. Thousands of theses and multiple books have been written on the subject of Woolf’s relationship to food–whether her disease was caused by childhood sexual abuse at the hands of her brother, or whether it was, as Madeline Moore theorizes, “one of Woolf’s ascetic practices, adopted as a last-resort gesture of feminist political defiance adopted in a situation of disempowerment” (Glenny, 21-22). Whatever its cause, Woolf’s struggle allowed her to create some of the most powerfully symbolic eating scenes in all of literature. You could dissect the boeuf en daube scene in To the Lighthouse for hours–how it represents Lillie’s struggle to resist the entrapment of becoming a wife and mother, specifically a mother like her own. Or how the preparation of the meal is representative of the microcosm that is Mrs. Ramsey’s world and how the moment of its serving is the moment of her greatest introspection (“But what have I done with my life? thought Mrs. Ramsay, taking her place at the head of the table”–17). But all I really want to impart to you right now is that boeuf en daube is absolutely delicious and well worth the effort to make, even in the middle of August. 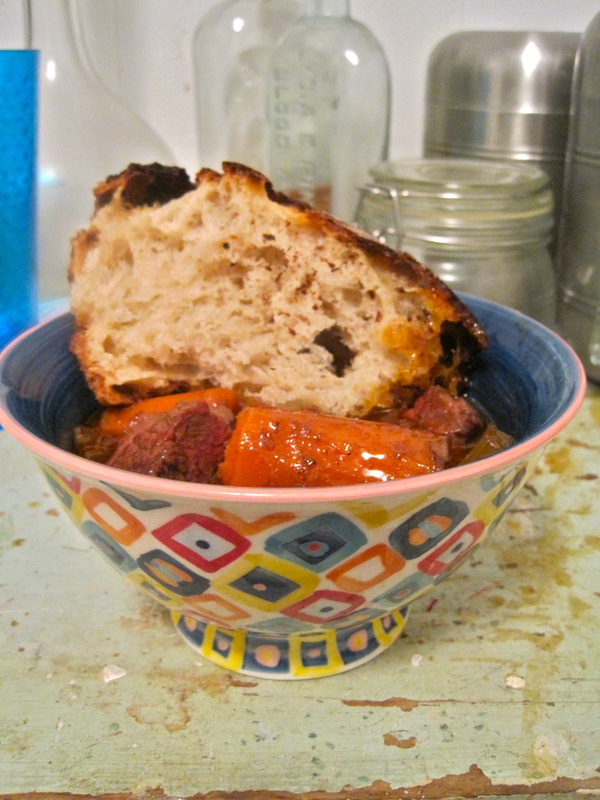 It got better and better over the course of about 3 days, and if you can’t possibly imagine eating a hot stew right now I will tell you that in this house we enjoyed it cold on thick slices of sourdough and it was fantastic. 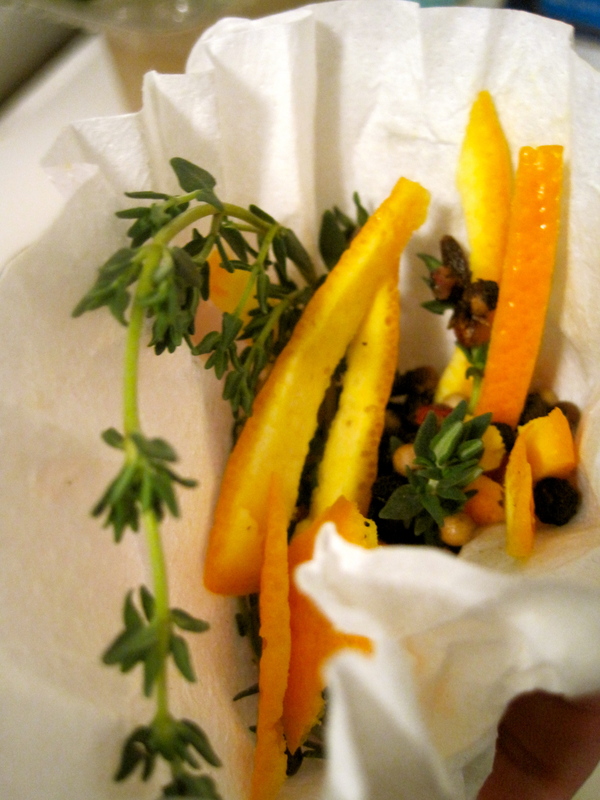 Make a bouquet garni: Put thyme, bay leaf, cloves, peppercorns, and zest on a piece of cheesecloth; tie into a bundle. 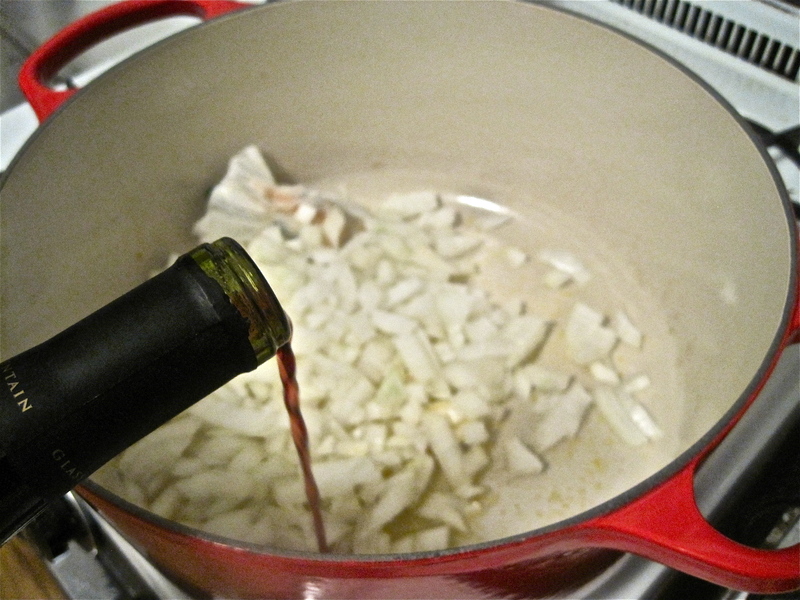 Combine onion, garlic, celery, carrots, bouquet garni, and wine in a large non-reactive bowl. Add beef, and toss to coat. Cover, and marinate in the refrigerator 24-36 hours, stirring occasionally. Preheat oven to 300 degrees. 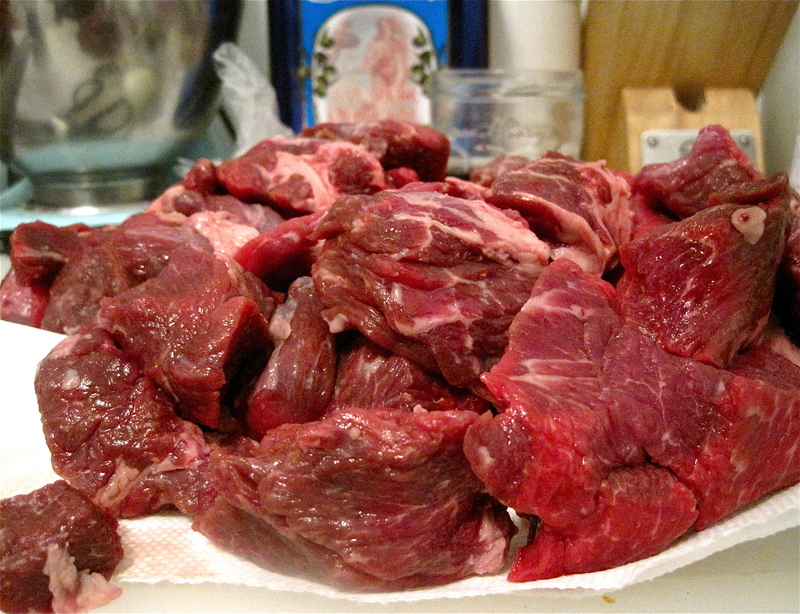 Remove beef from wine mixture; pat dry with paper towels. Set aside. 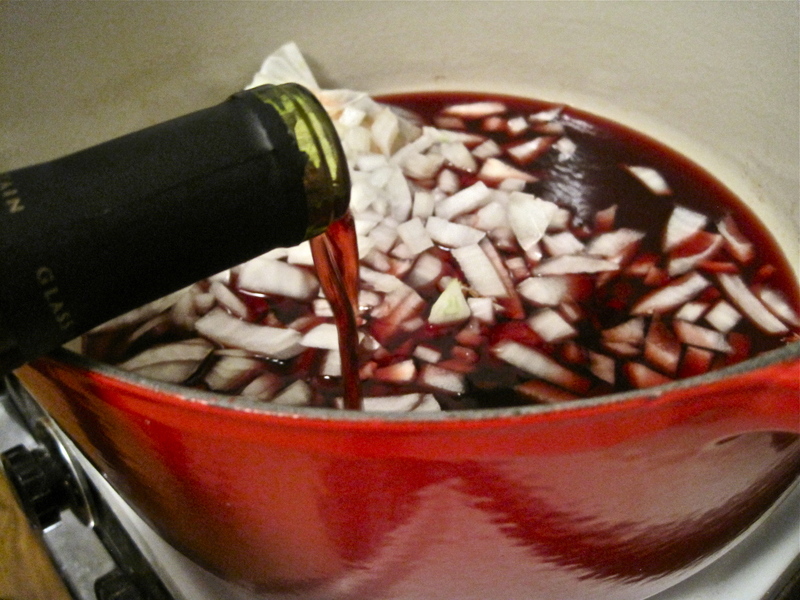 Transfer wine mixture to a heavy pot; bring to a boil. Reduce heat; simmer 5 minutes. Set aside. Heat 2 tablespoons oil in a large skillet over medium-high heat. Cook half of the beef, turning, until deeply browned, about 2 minutes per side. Transfer to a plate. Repeat with remaining oil and beef. Stir tomato paste into stock; add to the skillet, scraping up browned bits with a wooden spoon. Add to wine mixture. Stir in olives and beef. Season with salt. Bring to a simmer over medium-high heat. Cover daube; transfer to oven. Cook 2 hours. 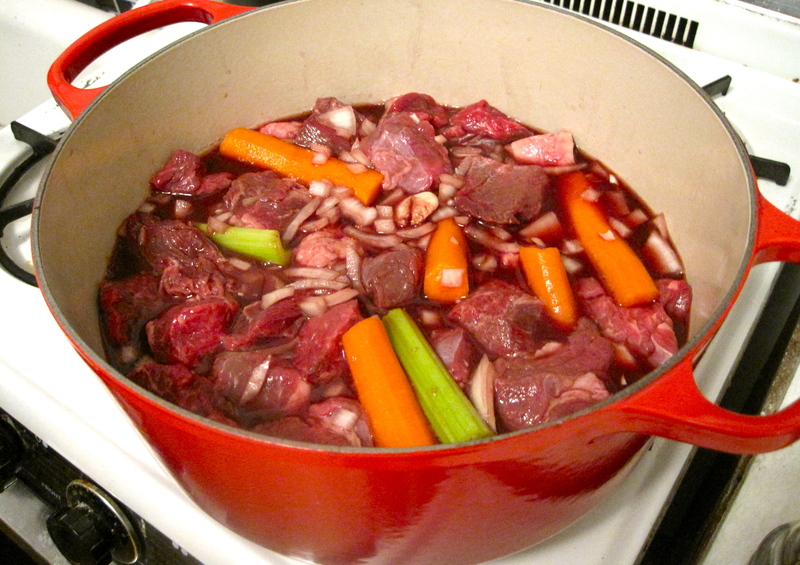 Reduce oven temperature to 275 degrees.if daube starts to boil. After 2 hours, stir in orange juice. Cook until beef is very tender, about 30 minutes more.